Published in the South Kent Gazette, 13 February, 1980. At No 153, Snargate Street, or thereabouts, there was, previous to the year 1790, a private theatre, mainly supported by the Fector family, which was given up when the new theatre was built. At No 41 resided, in the early part of the 19th Century, Mr Thomas Lewis, surgeon, father of Mr Thomas Lewis, who was Clerk of the Peace for Dover for nearly thirty years prior to his death in 1908. On the cliff side of the street, opposite the opening, from the early part of the 19th Century until its close, were "Court's wine vaults" — an extensive range of passages in the cliff — with a very handsome residence facing the street and pleasant terraced grounds up the cliff towards Adrian Street, including the miniature castle still to be seen on the cliff edge until recent times. Next, above Court’s, in 1845, was located the London and County Bank, and the residence of the manager, Mr John Bedingfield Knocker, R.N., J.P. His cave tomb in Cowgate Cemetery was broken by a bomb dropped by a German seaplane in May, 1916. He was born in 1793, and served with Admiral Collingwood in the Napoleonic wars. The bank premises now constitute the Dover Masonic Hall, which were opened on August 2nd, 1886, and in 1934 considerably enlarged although the frontage was unaltered. 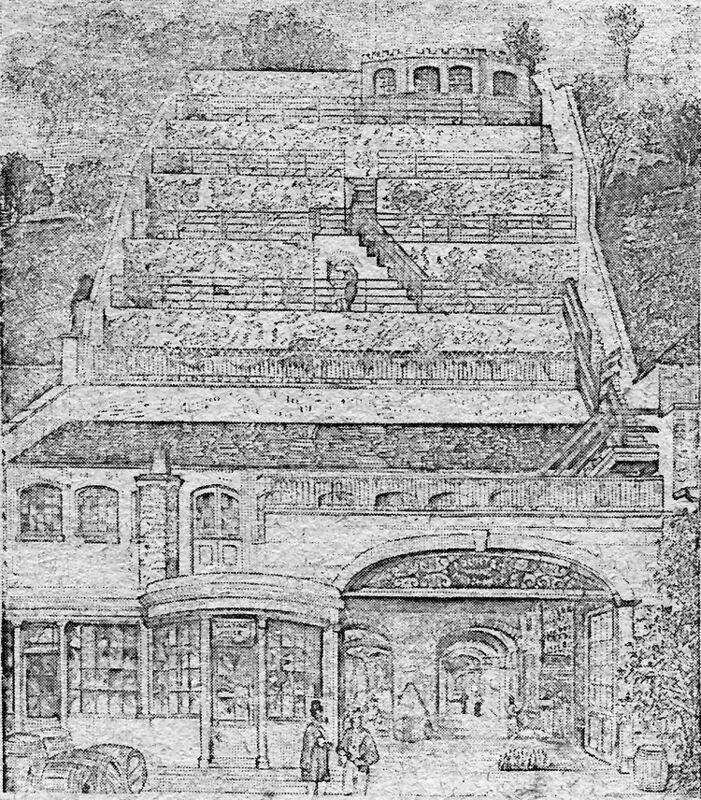 The entrance, in 1863, to Court’s extensive wine vaults which extended into the cliffs at Snargate Street, with a terraced system of gardens up the cliff face topped by a miniature castle. The steam packet office of Messrs Hayward and Co, were at No 141. To Messrs John and William Hayward belong the honour of being among the first to employ steam in navigating the Dover route to the Continent. The Rob Roy was the first steam vessel that came to Dover; that was in the year 1820, and it made some passages on the Dover and Calais route, its owner being a Scotsman named David Napier; but that vessel was soon sold to the French, and sailing vessels continued to carry passengers and cargo. In 1822, two steam vessels, the Sovereign and the Monarch, were brought to Dover by Messrs Hayward, who continued to run two steamers from Dover to Calais and Boulogne, until the opening of the South-Eastern Railway to Folkestone, when their vessels were transferred to that port, the railway not having been extended to Dover at that time. This perambulatory description of Dover has come to a part where, in 1929-30, a very great change was made to provide more quay space beside the Wellington Dock. 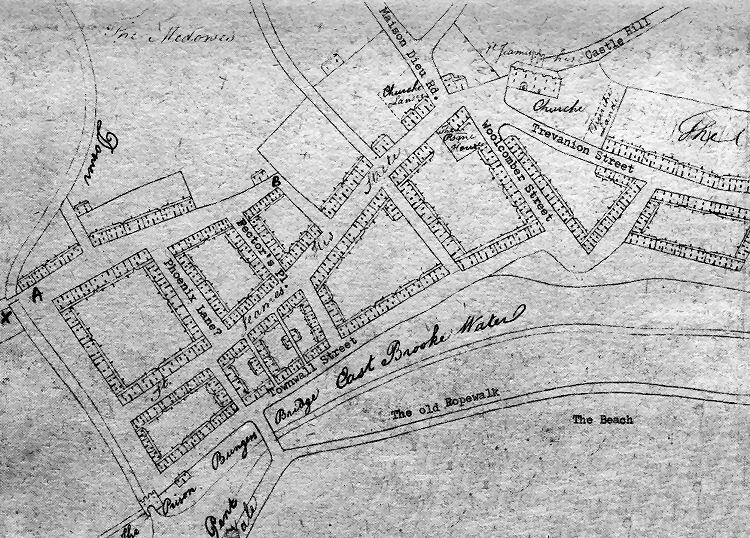 The Dover Harbour Board obtained Parliamentary powers to pull down the whole of the block of buildings which formed the seaward side of lower Snargate Street and the Commercial Quay houses and shops which backed on to that side of Snargate Street. In this portion of Snargate Street none of the existing houses were ancient, and it is probable that 275 years would cover the existence of the whole of them and their predecessors. The houses left on the cliff side are undoubtedly the oldest, and, originally, they were largely composed of wood and thatch, which subjected them to frequent destructive fires, which suggested the idea of leaving several "fire alleys“ at intervals between the houses on the south side, so that the firemen could quickly get the water from the Pent to arrest the conflagrations. The best houses in this part were on the sea side, built about the beginning of the 19th Century, having their principal windows slightly bowed, the convex form being characteristic of the period. Some of these will be seen in our illustration (Part 25) which is from a drawing of the central part of lower Snargate Street, made after the completion of the Grand Shaft, in 1802, and before the building of the Wesleyan Chapel beside the Grand Shaft, in 1834. This engraving was first published in 1830, but it is from a drawing of some years earlier. At No 128, Snargate Street was the drapery business of Mr John Agate, who was the chief mover in the establishment of the Dover Trades’ Holiday in July, which was for a quarter of a century honoured as a local holiday. In March, 1872, Mr Agate received a testimonial from the Dover shop assistants, in recognition of his efforts on their behalf. Later these premises became the Gordon Cafe and Temperance Hotel. ‘‘The Pier“ was the general name given to the whole of the town below where Snar Gate stood, that part of Dover having been reclaimed from the sea by the pier built by Henry VIII, and by the works carried out during the reign of Queen Elizabeth and we will begin this survey with Snargate Street (Without). When Snar Gate was built, in the 14th Century, the whole area down to Archcliffe Point was a tidal beach, and after the land in that direction was reclaimed by the harbour works, in the latter part of the Tudor period, the district called “The Pier“ came into existence. A section of an 1812 copy of an unpublished map, held by the Registry of the Archdeacon's Court, at Canterbury and dated 1638, of the parish of St James and the Warden Down area. It was drawn by William Eldred by order of churchwardens William Wade and Robart Steade. Opposite St James’s Church, across Woolcomber Street and the opening into Trevanion Street, is the old parsonage house and, bottom left are “The Prison“ and Bungers Bridge over the “East Brooke Water“ of the River Dour. The prison, pictured straddling the river, is probably one of the town wall towers at or near what we know today as New Bridge. These towers were used as lock-ups until it was decided, in 1746, to site a prison in the market place. At the point marked ‘X’ was a highway described as Turnpike Lane going towards the market place. Running parallel with St James’s Street, in the foreground is Town wall Street running into Clarence Street. Dolphin Lane and Russell Place are believed to be the highway from ‘A’ to ‘B’ with Phoenix Lane and rector’s Place connecting them with St James’s Street. Another map of St James’s parish, dated 1738, describes the area between St James’s Street and East Brooke Water as the Pent.